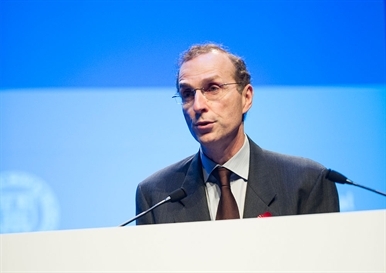 Treatment with a triple antiretroviral combination containing once-daily integrase inhibitor dolutegravir (Tivicay) is superior to the ritonavir-boosted protease inhibitor darunavir (Prezista) over 96 weeks of follow-up, Jean-Michel Molina of the Hôpital Saint Louis, Paris, reported at the HIV Drug Therapy Glasgow conference last week. Dolutegravir is also a component of the fixed-dose three-drug combination Triumeq, which contains abacavir and lamivudine. The findings came from the FLAMINGO (or ING 114915) study, a multi-centre phase IIIb trial that compared dolutegravir to darunavir/ritonavir in a first combination of antiretrovirals. It recruited adults living with HIV who had a viral load over 1000 copies/ml, who had not taken treatment before, and who showed no sign of viral resistance. The study participants were randomised to receive dolutegravir or darunavir/ritonavir with an investigator-selected backbone nucleoside (NRTI) regimen: tenofovir/emtricitabine or abacavir/lamivudine. Participants were stratified by baseline viral load above or below 100,000 copies/ml and by backbone regimen. The doses administered were 50mg of dolutegravir once daily or darunavir/ritonavir 800/100mg once daily. The primary endpoint was the proportion of people with a viral load of less than 50 copies/ml at week 48 of treatment, and the secondary endpoints were the antiviral activity, safety, tolerability, health outcomes and viral resistance. A total of 484 people were randomised and treated, with 242 in each of the two treatment groups. As reported in The Lancet in April 2014, 90% of participants receiving dolutegravir (217), and 83% of those receiving darunavir/ritonavir (200), had achieved a viral load of less than 50 copies/ml. The difference between the two groups being significant, investigators concluded that dolutegravir was superior to darunavir/ritonavir in treatment-naive patients. The 96-week results of FLAMINGO were presented at the Glasgow congress. Eighty-six per cent of participants in the dolutegravir arm and 79% of participants in the darunavir/ritonavir arm completed the 96-week study. At week 96, the proportion of these remaining patients with a viral load of less than 50 copies/ml was 80% in the dolutegravir arm and 68% in the darunavir/ritonavir arm. Overall, virologic non-response to treatment (dolutegravir 8%; darunavir/ritonavir 12%) and non-response due to other reasons (dolutegravir 12%; darunavir/ritonavir 21%) occurred less frequently with dolutegravir. Similarly to the week 48 results, the difference between arms was most pronounced in participants with high baseline viral load (>100,000 copies/ml) (82 vs 52% response through week 96) and in people taking the tenofovir/emtricitabine backbone (79 vs 64%). Responses were consistent in the abacavir/lamivudine stratum. Six participants (dolutegravir two, none post-week 48; darunavir/ritonavir four, including two post-week 48) experienced virologic failure, defined in the protocol as a viral load over 200 copies/ml at or after week 24, but none had treatment-emergent resistance to the study drugs. As in the week 48 results, the most frequent drug-related adverse events were diarrhoea, nausea, and headache, with diarrhoea more common on darunavir/ritonavir (24%) than on dolutegravir (10%). Also, there were significantly more people with grade two fasting LDL cholesterol elevations on darunavir/ritonavir (22%) than on dolutegravir (7%) (p < 0.001); and creatinine levels for dolutegravir, higher than in darunavir/ritonavir as observed since week 2, remained stable through week 96. In conclusion, at 96 weeks, dolutegravir 50mg once a day remained superior to darunavir/ritonavir 800/100mg once a day and maintained a good safety profile. Investigators concluded that dolutegravir 50mg once a day with either abacavir/lamivudine or tenofovir/emtricitabine is a suitable option for treatment-naive patients, a conclusion endorsed in the 2014 update of the European AIDS Clinical Society (EACS) antiretroviral treatment guidelines. FLAMINGO is ongoing in an open-label extension to provide more long-term data from people taking dolutegravir.